Stocks plummeted out of the gate, but recovered most of those losses by the close. Early weakness pushed us under prior support at 1,950, but the selling stalled minutes later as we bounced off 1,945. Volume was surprisingly light for such a wild ride. Bears who claim this market is complacent are 100% correct, unfortunately for them that complacency is working to the bull’s advantage. After a horrific open, bears had the perfect setup for an extended and bloody two or three percent selloff. What happened instead? Owners shrugged and continued holding, abruptly stymying the wave of selling. What was supposed to result in a mad rush for the exits was met with a yawn as complacent owners stayed put. Without supply flooding the market, it was inevitable we would bounce and that is exactly what happened. The notion of complacent owners is further evidenced by the low volume that showed how few people reacted to Thursday’s dramatic open. Conventional wisdom says complacency is bearish, but as we saw first hand today, in the near-term complacency is quite bullish. Only over time does complacency become a problem after most prospective buyers are already fully invested and there is no one left to buy. As we keep making new highs, clearly that is not the case yet. 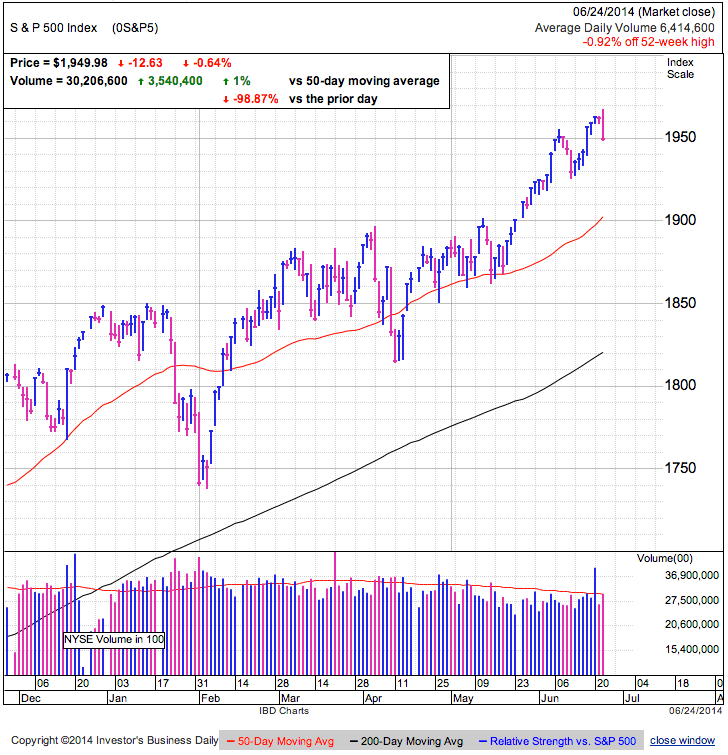 Holding 1,950 through Friday will show bulls are still in control of this market. Failing to maintain this level means we are quickly running out of dip-buyers. While no one knows for sure which way this will go, the market will tell us real quick what its intentions are. Breakdowns happen shockingly fast, so if this pause stretches across multiple days, that tells us Wednesday’s selloff was little more than a head fake. 1,950 is quickly shaping up as the line in the sand for both bulls and bears. Hold above this level, then bears should cover their shorts. Break under it and bulls should take some profits off the table. Stocks bounced from yesterday’s selloff after finding support near 1,950. This rebound recovered two-thirds of Tuesday’s decline on average volume and puts us within a few points of all-time highs. Bulls are breathing a sigh of relief as dip-buyers rush in after only a single day of selling. It sure feels like this is the easiest market ever. Anytime stocks go down, buy more. Repeat over and over until obscenely wealthy. The problem with obvious trades is they rarely work for long. If we looked strictly at active market participants, they are for the most part invested in this market and under normal conditions we would be setting up for a normal and healthy down-wave. The wildcard is investors still sitting out following the 2008 carnage. Are they finally warming up to this stock market that does nothing but go up? 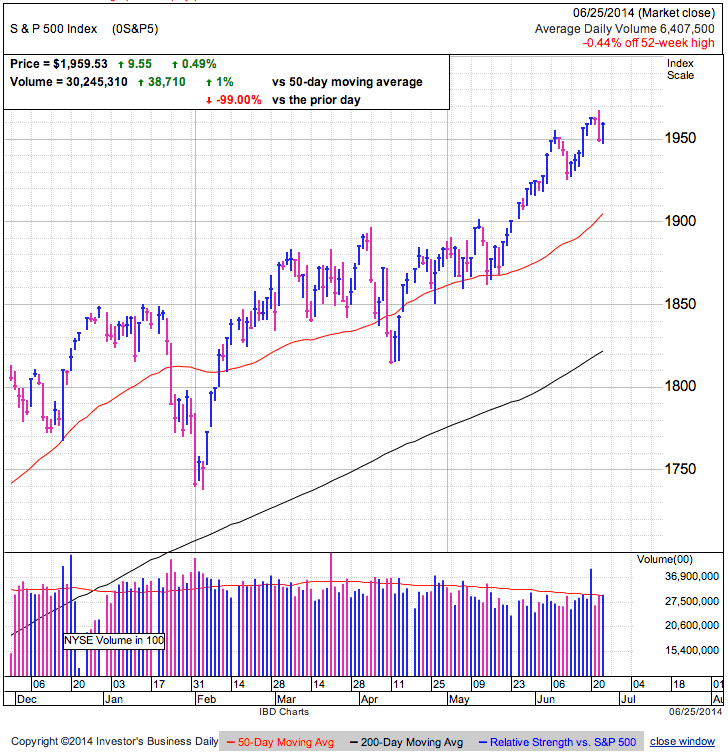 While these participants are usually the last to the party and suggest we are getting closer to a top, their buying in the near-term keeps the good times rolling. Since buy-the-dip has become such an obvious trade, it is not surprising we bounced Wednesday. 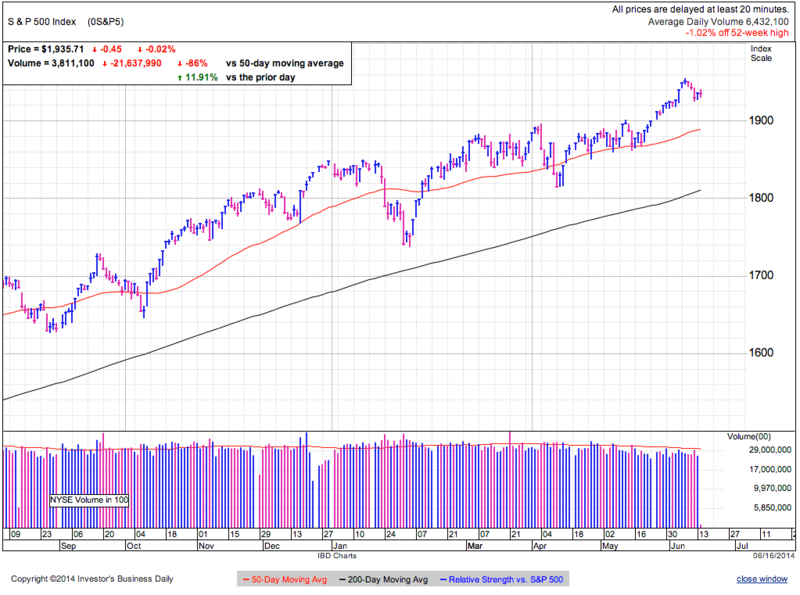 The bigger question is if this bounce is sustainable or just one last gasp of hope before returning to the 50dma. While no one knows for sure, the market will let us know which way it wants to go real quick. An absence of buyers on Thursday tells us to expect more selling in the near-term. But if we hold 1,950 into Friday, it means owners are not selling and without excess supply, prices will hold steady. While this buy-the-dip trade is getting a bit too obvious, as long as people are willing to throw money at record highs, we’ll keep marching higher. Picking tops is tricky business, but if 1,950 support barely lasts 24-hours, that shows demand is weak and we have lower prices in our future. If this were easy, everyone would be rich. Markets move higher as they turn cynics into believers. There are still a lot of people who don’t believe in this market and those are the next round of buyers when they become more afraid of being left behind than they fear heights. If bulls cannot defend 1,950, owners should consider locking in profits and bears can jump on the short side. Use recent highs as a stop-loss. Today brought a fairly substantial reversal in fortunes as we tagged a record high in early trade before collapsing nearly 20-points to 1,950 support. The 50dma is still 50-points underneath us and the 200dma is way back near 1,825. Today served as a wakeup call for laxidasical bears who were growing accustomed to a never-ending climb higher. There was no obvious catalyst to this selloff and the biggest piece of the news showed the housing sector improving more than expected. Seeing the market reverse from fresh highs on good news is rarely encouraging and enough to give us pause. The big question is if this is the start of something larger or just another buyable dip on the way higher. As we find ourselves in the middle of summer vacation trade, these lighter volumes can lead to increased volatility due to smaller trades carrying more influence. Anyone who thinks bulls will panic and rush for the exits is going to be disappointed. Complacent owners expect this weakness to bounce like it has every other time. The greatest trade of the last two-years has been buying the dips and the masses are finally waking up to this trend. This is how a paranoid market that flinched at every mention of Sequester, Fiscal Cliff, Cyprus, and Taper transitions to one that barely budges as war breaks out in Eastern Europe and the Middle East. Reactive selling at any point over the last two-years invariably lead to regret as those sellers watched the rally leave them behind. There are only so many times you can fool a person before they wise up. The problem for many is the more popular something becomes in the market, the less likely it is to keep working. While everyone’s been calling for a correction since early 2013, eventually they will be right and we are closer to that day than ever before. While no one can predict where this market will top, it is riskier to own when everyone feels safe and with the market near record highs and the VIX near record lows, it is hard to claim this market is fearful. Trends continue until they don’t. While it is clearly premature to call the bull market dead, we all know markets go up and down. With 20 of the last 27 trading days ending in the green, it isn’t unusual for us to pause and see a few days of distribution. We have support back at 1,925, 1,900 and the 50dma. It wouldn’t surprise anyone to see us retest these levels. And a bull should be hoping for this since a little backfilling makes a continued rally more sustainable. Every dip has been a buying opportunity and will continue to be a buying opportunity as long as chasers have money to throw at the market. We already know owners no longer flinch at headlines or weakness, so it will take an exhaustion of demand to defeat this bull. Figuring out when everyone has bought in and there are no more buyers left is one of the hardest things to do in the market. Since a trend continues countless times but only reverses once, it is more likely this dip will bounce like all the others before it. 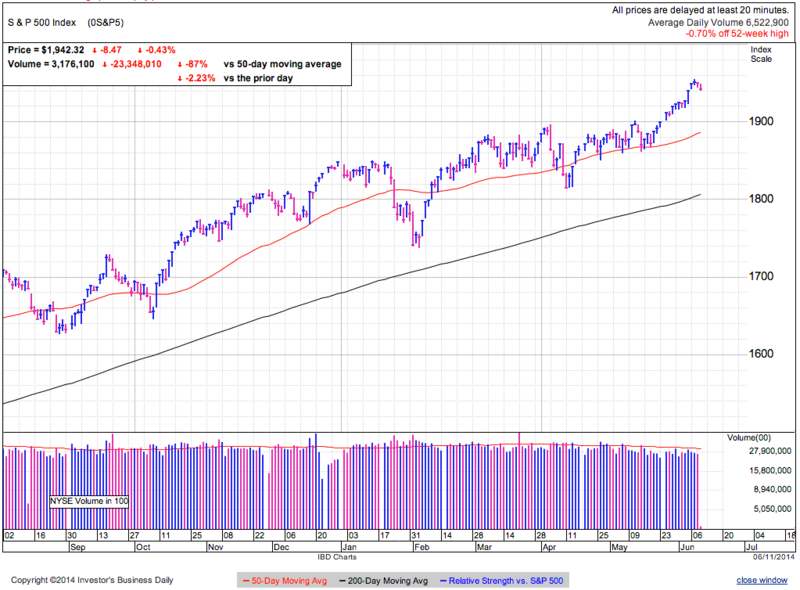 While today’s reversal felt dramatic, we are only 1% from the highs and a long way above the 50 and 200dma. Given markets move two-steps forward, one-step back, even a bull should wait a couple of days to see how far this step back goes. An uneventful day with only 5-points separating the highs from the lows, ultimately finishing unchanged. 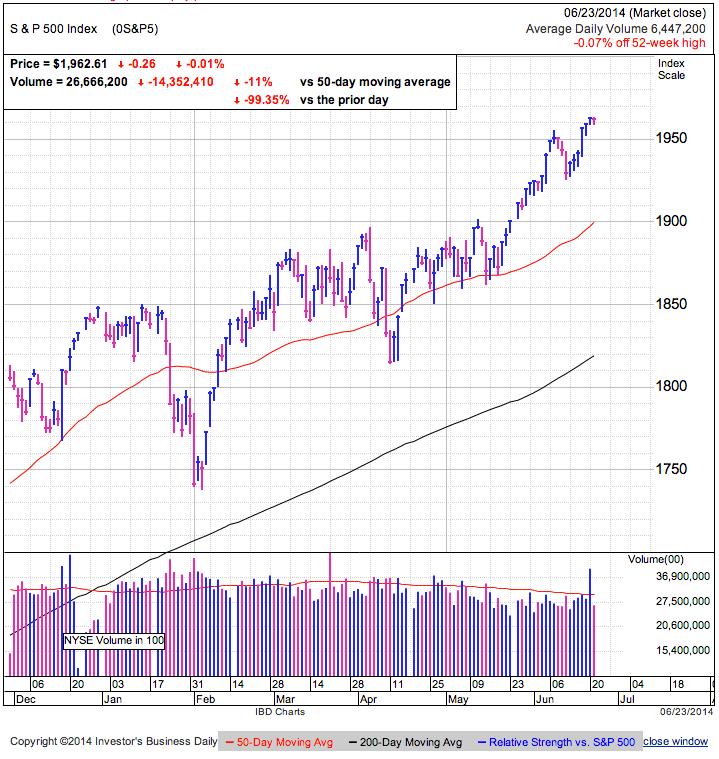 The market is 60-points above the 50dma and aside from Friday’s elevated quadruple witching, volumes have been below average. Stocks are at record highs and the VIX near record lows. There has never been a more comfortable time to own stocks and this complacency has many owners holding regardless of headline risk. This lack of interest in selling keeps a lid on volatility and every five- or ten-point selloff stalls and bounces when no one joins in the selling. With so little supply hitting the market, it is extremely easy for the market to continue climbing higher. But the lack of concern means we are closer to the end of this move than at the start of a new leg higher. Sustainable rallies are built on the back of fear as they climb the proverbial wall of worry. When no one wants to own the market, it allows the bold trader to buy stock at steep discounts. But as the masses become comfortable owning stock, they will only sell if someone offers them a premium price. This bouncing between discount and premium is what gives us the typical gyrations in the market. Given where we are and where we came from, it is hard to claim sellers are dumping shares at a discount here. Since humans naturally look at the recent past and expect the trend to continue, many traders are sitting on their stocks expecting the good times to continue well into the future. And they will be right as long as we keep finding new buyers willing to pay even higher prices for stocks. This is the basis for the “next greater fool theory”. Many people continue holding stocks even when they know they are too high because they assume someone else will come along shortly who will pay even more money than they did, and so far they’ve been right. But how long will the music keep playing? Expected Outcome: Keep inching higher until something catches the market by surprise. Everyone knows the VIX will not stay at 11. What no one knows is why it will spike or when that will happen. Will insurgents blow up a key pipeline in Iraq? Will economic indicators start heading south? Will a geopolitical event thrust uncertainty into western economies? Will it be a natural disaster? I have no idea what it will be or if it will happen next week, next month or next year. Knowing what will happen is easy, all the money is made getting the timing right. There is no reason we cannot have another 30% year before the inevitable fall. So far the right trade has been ignoring all the calls for a pullback and it will likely continue this way…..until it doesn’t. It is more profitable to buy discounted stock and sell it at a premium than the other way around. While buy-high, sell-higher can work in individual momentum stocks, the broad market is so large it rarely gets as carried away by the momentum trade. We go a little too high and then we go a little too low and then we go a little too high again. Repeat until either rich, broke, or confused. It is hard to find discounts up here to justify the risk/reward of initiating new positions, but those sitting on profits can use a trailing-stop to protect their profits if things start to break down. As for the shorts, you will be right at some point, the key is not getting killed between now and then. 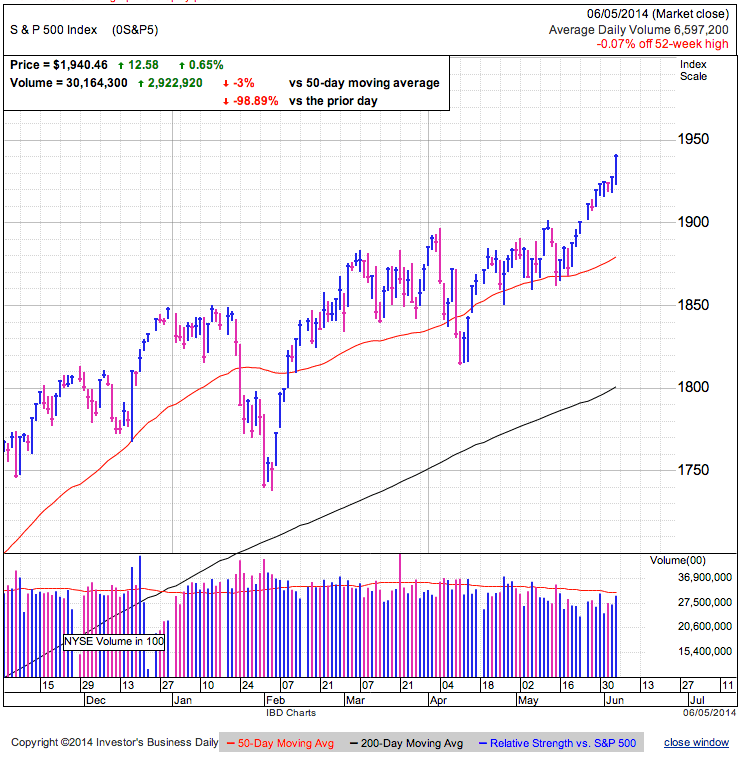 Stocks are holding the recent breakout following a modest test of 1,925 support last week. Volume remains light in the traditionally slow summer vacation months. We are holding record highs in spite of negative headlines coming out of Iran and the potential for more political gridlock in DC. With multiple days to digest these headlines, they are largely priced in and we shouldn’t expect further selling based on what we already know. Markets crashes typically arrive with a sell first, ask questions later reaction to spooky headlines and the fact we held 1,925 support for a 4th day suggests this market is indifferent toward these concerning headlines. Barring an unexpected deterioration in the situation, we should expect the uptrend to continue. These headlines rattled nerves, but didn’t cause many people to hit the sell button. Five-years into this bull market and nearly three-years since we’ve seen anything resemble market panic, investors have become very complacent. While we all know this cannot last, in the near-term complacency is bullish because it means most owners are unwilling to sell no matter what is going on around them. Their confidence keeps supply tight and makes this death-defying really possible. Confounding the skeptics and finding support tells us there is little that will rattle this market. While history reminds us this cannot last forever, in the near-term this “hold no matter what” attitude among stock owners keeps pushing us higher. At this point it doesn’t seem like we will find a headline that sends owners running for the exits and instead this market will only top when we run out of optimistic buyers. Markets rarely get things right the first time and this leads to over and undershooting. Fears of Sequester and Fiscal Cliffs were clearly overblown. This time we are largely ignoring civil war in Eastern Europe and the Middle East. Under appreciating the risks involved in these situations leaves us vulnerable to a worse than expected outcome. The higher we go, the harder we fall. Anyone sitting on profits should have an exit plan. Maybe that is proactive selling into strength or it is a trailing stop, but don’t let complacency cause you to let these profits evaporate when the market rolls over. Bears waiting for this market to crack need to be patient. These headlines out of the Middle East were the perfect catalyst, but since the weakness already bounced back, admit defeat and wait for something bigger. Stocks are bouncing around today as they digest overseas headlines. We are one percent from recent highs and nearly 50-points above the 50dma. Prior resistance near 1,925 is acting as support and we are holding this technical level for a 3rd day. Volume has been below average every day for nearly a month, but this is typical of light summer vacation trade. Without big money’s steady hand, summer can be volatile as smaller traders have more influence. This is especially true when the market is trying to digest worrisome headlines coming out of Iraq and a potential flare up of political discord in DC. While we are only a few points from all-time highs, the market is anything but relaxed. Ignore the headlines and buy the dip has been the rally call of last couple years and many are sticking to that game plan here. Buyers showed up to defend 1,925 and so far are preventing any further selling. Their cause is aided by confident owners unwilling to sell fearful headlines, keeping supply tight. Last year the market jumped at the sight of its own shadow as we had temporary selloffs on headlines of sequester, fiscal cliffs, Arab spring, and taper to name a few. This year prospects of war in Ukraine and Iraq are met with cautious optimism. While it is encouraging to see the market hold up in the face of these headlines, the best profit opportunities come from irrational market moves. While participants are nervous over these geopolitical headlines, no one is fearful enough to sell their stock at a discount. After nearly two years of watching every dip bounce back to new highs has trained owners to hold no matter what. With so few sellers, the future of this market rests on the buy side. As long as buyers keep soaking up what little selling we have, the market will continue higher. But every rally reaches a point where everyone who wants stock already has all they can hold and the market stalls on a lack of new money. The longer we hold up in the face of these headlines, the less likely they will take us down. Markets tend to roll over quickly and avoiding a precipitous drop as these headlines break means they are well on their way to being priced in. Owners are demonstrating comfort with the risk/reward at these levels. With such a little discount being offered to hold this risk, the market is telling us it doesn’t expect these events to deteriorate in any appreciable way. That leaves buyers vulnerable to a worse than expected outcome that is clearly not priced in. The best profit opportunities arise from emotional and irrational moves in the market. Since no one is offering us a discount to hold this risk, there is little reason for us to own these headlines. The same goes for shorting the market. We had the scary headlines and the market didn’t flinch, meaning it will take something larger to crack this market. At this point it seems we are in no-man’s land and where the market goes from here is a coin-flip. If I were forced to pick sides, holding these levels suggests we will continue higher, but any degradation of the situation in Iraq could set of a mad rush for the exits. With such a poor risk/reward, the best trade is to wait and see what comes next. Stocks slipped modestly as they consolidate near the 1,950 level. Early weakness brought us down to the low 1,940s, but dip buyers propped up the market and are defending these levels. Unsustainable breakouts tend to rollover quickly when follow-on buying fails to materialize. If we continue holding 1,940 for a fourth day, that suggests buyers still see value at these levels. Of course we need to be extra cautious during the summer’s low-volume since smaller trades have a larger impact and we often see increased volatility. Recent strength defies the skeptics but from a sentiment POV it makes perfect sense. We’ve transitioned from a fearful market in 2013 to a greedy one in 2014. While this rarely ends well, these moves go higher than anyone expects before breaking down. By itself complacency is bullish because it means most owners are unwilling to sell no matter what the headline or price action. They refuse to sell because they are confident any dip will bounce and so far they have been proven right. In a self-fulfilling prophecy, lack of selling keeps supply tight and makes it easy for the rally to continue. Markets move in waves and the risk of a pullback are highest following a strong move higher. At best we digest these gains and trade sideways, at worst we retest recent support back near 1,900. Either way the risk/reward to initiating a new position here is stacked against us. Give the market a couple more days before rushing in. Anything can happen during summer’s light volumes. The pain trade has clearly been higher as everyone expecting near-term weakness is either out of the market or short. These bears and cynics are scrambling to buy a piece of this market before it gets away from them and that reactive buying keeps pushing us higher. We trade when the odds are in our favor and buying up here is little more than chasing performance. 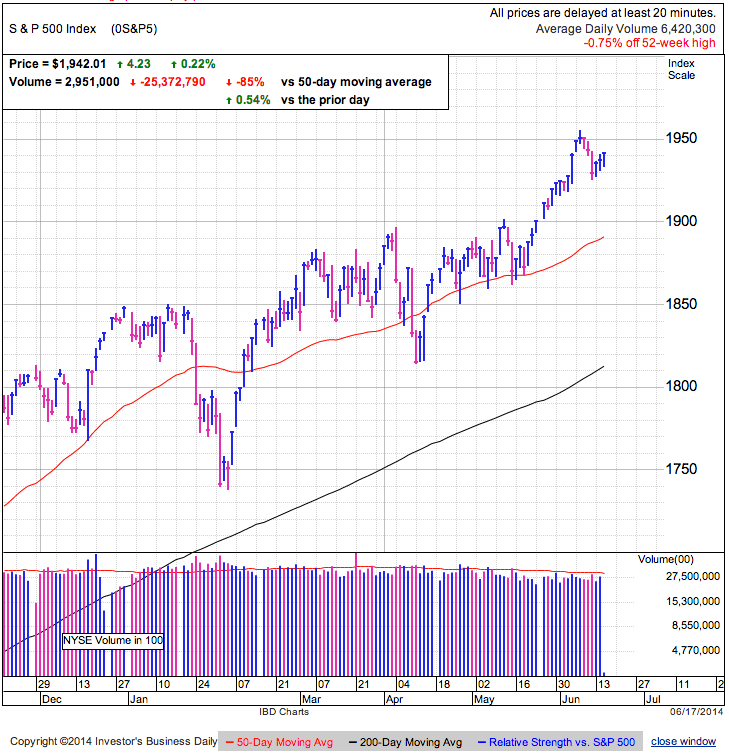 While this move could easily run toward 2,000 over the next few weeks, the market needs to catch its breath and we will have the opportunity to buy in a few days after the risk of a pullback fades. If we cannot hold 1,940, then things get interesting. Stocks surged into record territory, smashing resistance near 1,925. Volume was below average, but the highest in a week as today’s gains gives us 12 winners out of the last 14 sessions. Last year we had a laundry list of reasons to avoid this market, but this year people are struggling to find excuses to stay out. While that has been bullish as the last of the holdouts buy in, market rallies are typically built on fear and uncertainty not calm and confidence. After years of fearing a financial collapse around every corner, we’ve reached the point where most are more worried more about being left behind than the sky falling. While that sentiment reversal pushed us to record territory, a lot of good news has already been priced in and there is little, if any, discount being offered to hold market risk. While we can skate on thin ice all day long and never fall in, the lack of a risk discount leaves us more vulnerable the next time something rattles the market. The higher we go, the harder we fall and is why periodic pullbacks are a critical part of every sustainable rally. 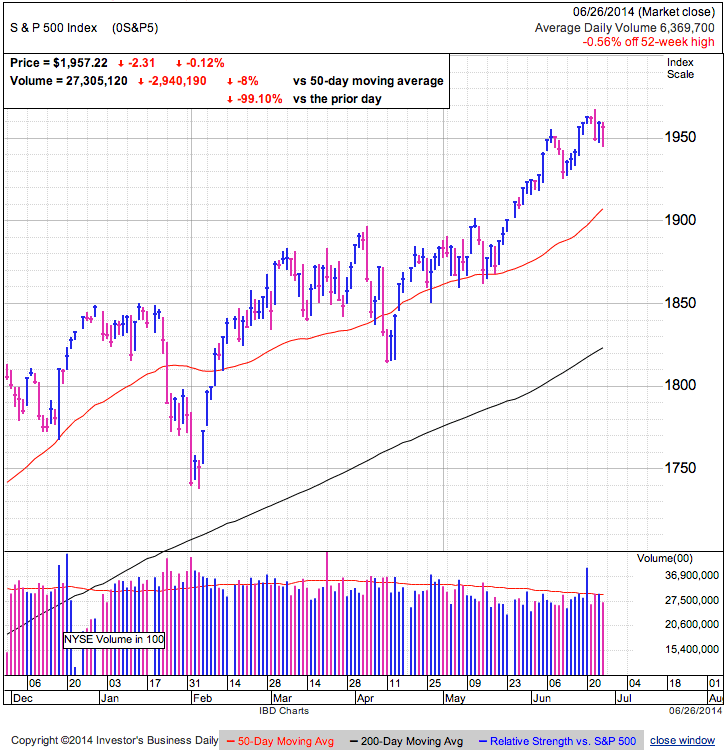 While we’ve had modest dips and consolidations along the way, most owners have grown accustomed to buying dips and have forgotten how scary and painful the market’s dark side can be. While I was expecting summer weakness to refresh this market, it appears like we might climb through the summer, leaving us vulnerable to an even larger pullback in the fall. 2013 was the year of the half-empty market as everyone focused on the risks. At the end of last year we transitioned to 2014’s half-full market where we embraced the nuggets of optimism and shunned any negativity. Today we cheered the most aggressive rate policy in ECB history without pausing to ask why such dramatic actions are needed. We will keep heading higher as long as buyers are willing to throw money at record highs. This will continue as long as the fear of missing profits trumps fear of losing money. But once that other shoe drops, the exits will be crowded. While we all know this market will pullback at some point, no one knows when or why it will happen. This is simply a waiting game and as long as the market continues heading higher, all is well with the world. We are in a secular bull market and we can go many years without a meaningful pullback as long as there is new money waiting to come in. Given how deep the 2008/2009 market crash was, there is still plenty of money sitting out of this rally. Chasing record highs is the riskiest time to jump in and anyone not already in the market will be better served waiting for the inevitable pullback to at least 1,925. Those lucky enough to be sitting on profits should move up their trailing stop and be ready to take profits if cracks start appearing.